We spent the week eating corn fritters in the morning and ice cream in the evening, walking on the beach and building sand castles. As the sun sets on the gulf, tiny mollusks no bigger than a fingernail line the shore. They rise from the sand with each passing wave, popping to the surface in large groups to feed. They pebble the beach, turning the shoreline into a shifting cobbled path. Just as quickly they bury themselves, hiding from sandpipers and the pounding of waterlogged feet. They shimmy and slip beneath the sand like dolphin fins beneath the waves. I don’t know how they do it, but I explained to Ian that they probably vibrate too quickly to see, shifting the grains of sand around them like a blanket. Ian would constantly fall behind. 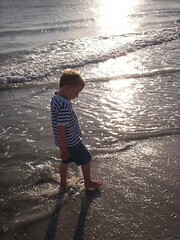 He looked for shells and fish, watched sand fleas dart between his toes and scatter from his footprints. He squatted with his hands on his knees and kept his face inches from the water, which told us just how far he’d come in his battle with the ocean. I glanced over my shoulder and saw him kneeling, his fingers digging in the sand. He ran toward us, heralded by the patter of his feet on the wet sand and holding something between his thumb and forefinger. He waved his hand in the air. He tossed the shell into the sea and ran back to his interrupted search, bookmarked by eroding footprints.